See you later / au revoir : 17 minutes en temps réel, 2008 (1/3). Under the curatorship of Marie-Ève Charron (independent curator and art critic for Le Devoir), Marie-Josée Lafortune (director of OPTICA), and Thérèse St-Gelais (professor of art history specialized in gender and women’s studies at uQAM), the exhibition “Archi-féministes!” brings together a significant body of historical and contemporary work by female artists who have contributed to the centre’s history since 1972. For the first time, we are broaching that history from a feminist point of view, an archival feminism proposing a retrospective and updated perspective concerned, among other things, with performativity in artistic practices and strategies deployed through photography, video, and the document. The exhibition, occurring in two parts, draws not only on the OPTICA Archives, but also on private, public, and artists’ collections. After “Archiver le corps” (“Archiving the Body”), “Performer l’archive” (“Performing the Archive”) brings together artists rooted in the documentary tradition, or revisiting it by way of performance, appropriation, accumulation and repetition. Besides interrogating notions of authorship and artistic tradition, these strategies examine and key off the artist’s body and the time of production and reception of the work. The practices of Sophie Bélair Clément, Raphaëlle de Groot, Vera Frenkel, Clara Gutsche, and Emmanuelle Léonard probe a variety of production processes through critical operations employing fiction, the body, personal narratives, reflexivity, and subjectivity. Since the 2000s, Sophie Bélair Clément has been producing collaborative installations that revisit contemporary works and reconstruct historic museum and gallery exhibitions. For OPTICA in 2009, she presented “Le son du projecteur,” a project based on her experience at the Museum Anna Nordlander (Skellefteå, Sweden) the previous year. With a master’s in visual and media arts at UQAM, Clément has exhibited in Quebec, Canada and abroad. Last fall, she took part in “The Québec Triennial 2011” at the Musée d’art contemporain de Montréal. Also holding a masters’ from UQAM’s École des arts visuels et médiatiques, Raphaëlle de Groot has, for the last ten years, produced works that often rely on the collection and archival reorganization of material. She has a great many group and solo exhibitions to her credit, the most important of which took place at Galerie de l’UQAM in 2006. In 2001, she took part in “Artists’ Gestures,” organized by OPTICA as part of the Saison du Québec à New York. De Groot is represented by Galerie Graff, Montreal. Vera Frenkel, who studied at McGill University, has won numerous accolades and awards, including the 2006 Governor General’s Award in Visual and Media Arts. 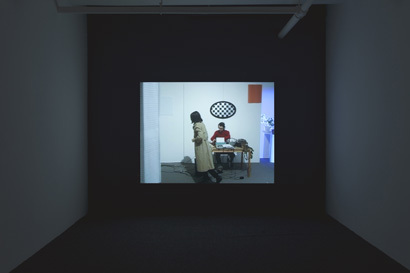 Her installations, performances, videos, and multimedia works present narrative elements that blur the distinctions between fiction and reality. Frenkel, a professor emerita at York University, has taken part in major solo and group exhibitions, including Documenta IX (Cassel, 1992) and the Venice Biennale (1997). At OPTICA, she took part in the exhibitions “Vérifications” (1984) and “Exposition rétrospective: volet II,” marking the centre’s twentieth anniversary in 1992; she is also among the contributors to Creative Confusions: Interdisciplinary Practives in Contemporary Art (2001). Clara Gutsche holds a masters in photography from Concordia University where she also teaches. She is noted for her documentary photography, particularly a renowned series on the Milton Parc neighbourhood jointly produced with David Miller and presented at OPTICA in the exhibition and catalogue “You Don’t Know What You’ve Got ‘Till It’s Gone... The Destruction of Milton Parc” (1973). Since 2000, her work has been the subject of solo exhibitions at a number of venues, including the Musée de la Photographie (Charleroi, Belgique), the Casa delle Letterature (Rome), VU (Quebec City), and Occurrence (Montreal). OPTICA and the curators gratefully acknowledge the support of the Conseil des arts et des lettres du Québec, volet soutien à des projets pour les organismes et les commissaires indépendants. Thanks to Ms. Natacha Martin and the organizations that have partnered with us: the Leonard & Bina Ellen Gallery (Michèle Thériault, Director, and Mélanie Rainville, Max Stern Curator) and the Agnes Etherington Art Centre (Jan Allen, Chief Curator and Curator of Contemporary Art, and Jennifer Nicoll, Collections Manager and Exhibition Coordinator). We are also grateful to Josianne Monette, who processed the works, Geneviève Bédard for managing the loans, Marc Dulude and Pierre Przysiezniak for the gallery installations, and to the artists Sophie Bélair Clément, Raphaëlle de Groot, Vera Frenkel, Clara Gutsche, and Emmanuelle Léonard for having graciously accepted our invitation. A 'not to miss' for Fall according to Jérôme Delgado («Galeries et centres d'artistes : Du trafic...dès maintenant», Le Devoir, January 14th-15th, 2012, p. E12.) and Nicolas Mavrikakis («Expos à contenus», Voir, January 12th, 2012.